“Huffy” Huffman, the retired Chairman of Huffy Corporation, Dayton, Ohio, had been involved in a successful “Miami Valley Regional Bicycle Council” which conducts a “Thunder Road Bike-a-Thon” and raises about $300,000 annually to support local trail development, cycling projects and health care charities. He and Bailey felt this “model” could be used to create the organizational vehicle and funding needed to provide a centralized entity for planning, coordinating and speeding up development of a regional recreational trail network in the three county area. As the concept was discussed with interested parties and potential funding sources, it became apparent this model was not likely to succeed in Northern Michigan, at least to the extent experienced in Dayton, Ohio, mainly because of population and geographic considerations. The Dayton approach was reworked and reviewed with the various parties already involved. Out of this grew the “Tri-County Bikeway Committee” (Emmet, Charlevoix and Cheboygan). An Organizational Chart, Bylaws, Budget and likely staffing was roughed out and presented to several potential “partners. U S Inc., a local “incubator” for rising non-profits headed up by John Tanton, M.D., became very interested in the project. The Petoskey-Harbor Springs Area Community Foundation, the Burns Clinic-Northern Michigan Hospital Foundation, the Offield Foundation, the Michigan Chapter of Rails-to-Trails and the Little Traverse Conservancy, while applauding the concept, were reluctant to become active partners in the initial endeavor. Subsequently, they all became involved. Tanton offered the new organization office space, facilities, use of US Inc.’s 501 ( C ) 3 status and limited guidance for nominal rent until the organization could fend for itself. During the development of the initial and final concept throughout much of 1995, Huffy was holding meetings every other week (and occasionally more frequently) initially with Bailey, Fettis and McCue and then adding others to fit the needs of the organizational chart and committee structure he envisioned. “Boo” Litzenberger offered to develop Articles of Incorporation patterned after those of the Little Traverse Conservancy for filing with the State (ultimately completed by John Vought, a Petoskey attorney); and, finally approved by the State of Michigan effective Sept.27, 1995. Bill Brown, a recent retiree from state government, was recommended by Andy Hayes, Petoskey Chamber Executive, to Huffy as a “can do” type who knew his way in state government circles and a potential replacement for Huffy. (Huffy, who spent his winters in Florida, had made it known he would be leaving this fledgling organization for health and age reasons once it established itself). Brown joined the group on July 12, 1995 and later became its first President. Others from the above list also became members of the organization’s first Board of Directors. Mr. & Mrs. Horace M. Huffman, Jr.
As the Tri-County Bikeway Committee continued to evolve, it became apparent this title did not do justice to the organization’s intent and mission. Already it was evident that the geographic area to be served would soon outgrow the 3 counties initially contemplated. Abandoned rail corridors were the primary basis to be used in establishing the trail network envisioned. The group already was aware of rail segments that were abandoned, or soon would be, that went beyond the three counties’ borders (e.g. ; Cheboygan to Hawks; Indian River to Gaylord). Since the mission involved facilitating and advocacy, the term “committee” didn’t seem quite appropriate. Various new titles were considered. Finally “Tip of the Mitt Trails Council” was selected. The “Tip of the Mitt Watershed Council” promptly advised that the similarity could cause identity problems for both parties. A change to “Top of Michigan Trails Council” was made even though Top of Michigan Electric Co-Op was present in this area. Fortunately, that company subsequently became part of Great Lakes Energy! Starting a new and somewhat unique organization from scratch can be a challenge to most persons – but not to Huffy Huffman, a master “arm-twister”! All through the process, he had been working behind the scenes to line up potential start-up money. The foundations noted above as well as many of his friends and business acquaintances had received his persuasive “pitch” and gave encouragement. Ultimately, $10,000 was pledged from eight Founding Members and several of the foundations committed to grants funding the next two years bringing the total to $46,000. This enabled the organization to consider hiring a full-time Executive Director, occupy the office space offered by US Inc. and commence full-time operations in late 1995. TOMTC had been meeting at the Little Traverse Conservancy’s offices near the intersection of M-119 and Powell Road during this developmental period and the first few Board of Director meetings until acceptance of US, Inc.’s offer of office space. US Inc.’s offices were located on the second floor at 316 ½ E. Mitchell St. in Petoskey. Other that for a severe climb up a narrow stairway, the location was fine – right in the middle of downtown, Petoskey! When the “space” assigned (a former storage area, 10’ x 12’ and no windows) was first visited by Brown, he gulped but quickly said, “Thank you very much!” He was shown the mail delivery “system”, the copy and fax machines and given keys to the office entry and street level doors. An old Steelcase desk (without feet) came from somewhere and was put up on cement blocks and dusted off. An old steel file cabinet was donated by Bob Valleau. Neal McCue was able to obtain an old work table from Boyne Highlands that was no longer of use to them. Various other used items appeared from other donors. The Trails Council now was in business in its own quarters. Brown ordered a single line telephone from the phone company. A computer with monitor was donated by the Conservancy. The only major purchases were a compatible printer and a telephone answering machine. US Inc.’s office lease was expiring in early 1999, forcing them, along with TOMTC to relocate. Dr. Tanton found larger and better office space on the second floor of the former Montgomery Ward building at 445 E. Mitchell St. which was being renovated by its new owner, the Petoskey Land and Cattle Co. TOMTC was able to negotiate more office space with Dr. Tanton and moved along with US, Inc. in January 1999. In late 2000, The Trails Council learned of newly renovated and larger space in the “lower level” of 445 E. Mitchell St. becoming available. The Trails Council moved into this new area in early 2001. The office was moved again, this time only 110 feet down the hall to a larger, more usable space. The layout provided two private offices with windows, two open office spaces and a closed storage room. In 2015, The Trails Council purchased the well-known and historically significant limestone cottage located at the highly visible intersection of the Little Traverse Wheelway, the North Western State Trail, and the North Country Trail. This new location for the TOMTC affords the best opportunity to create the place from which a “Trails Chamber of Commerce” can plan, execute and evaluate programs that help communities become “trail towns” and realize the greatest economic impact of the trails. 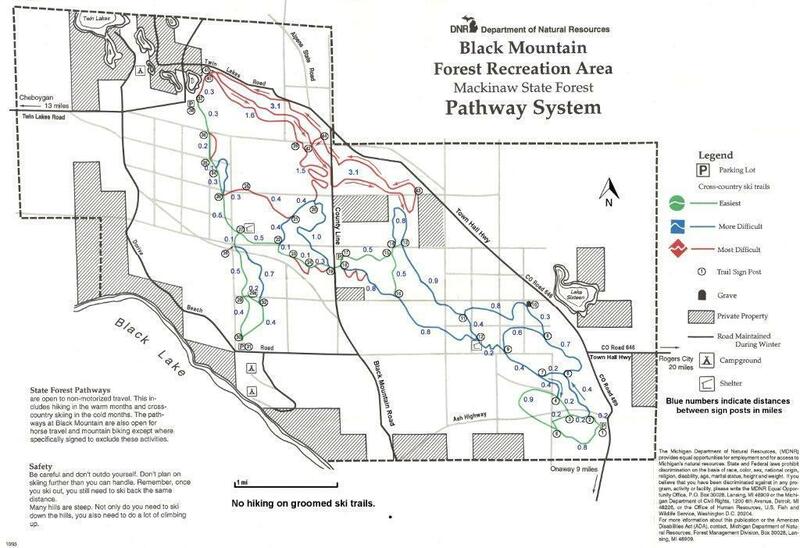 The new “Packy Offield Trail Center” has become a place where trail users can find information on the trails of Northern Michigan. It is also a base for youth and family programs/events, and a meeting place for area trails organizations. In late 2005, on the “retirement” of President Jerry Corley, the board again decided to bring in a new executive director to professionalize our operation. The volunteers were proud of what they had done but recognized that there is no substitute for a director with professional skills to carry us into the future. The current Executive Director, Jeff Winegard, has served since 2010. Prior to the advent of TOMTC, The Little Traverse Wheelway Committee, an offshoot of the Little Traverse Kiwanis Club, lead by Fred Fettis and Max Putters, had been working since 1976 to re-establish the trail around Little Traverse Bay that existed prior to the turn of the Century (1890-1910) and linked Petoskey with Harbor Springs. The Char-Em Trail Committee (on which Fettis, Brad Leech and Dr. Dwayne Griffin served) was similarly working to get a recreational trail from Petoskey to Charlevoix. The Fettis-Putters group had been successful in getting the trail eastward from Charlevoix Avenue (US 31 S) west of Northern Michigan Hospital along the shore to Magnus Park and through Bay Front Park ending on the salmon colored (pink) sidewalk through Bay View to Division Street. The Char-Em Committee had been working with the various property associations and landowners to obtain easements for the western end of the trail but with limited success. It did make an important break-thru in dealings with State Representative, Pat Gagliardi and State Senator, Mitch Irwin, by obtaining a commitment of $500,000 toward the construction of such a trail to Charlevoix if and when ROW easements were obtained. This led in part to the 5.5-mile trail adjacent to what is now Bay Harbor. 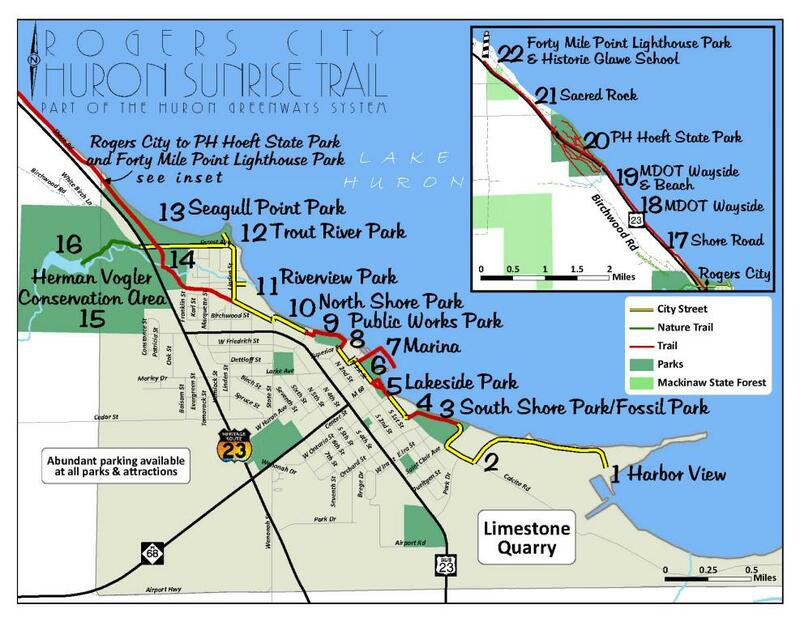 In 1991, Fred Fettis had begun to get the Harbor Springs Kiwanis Club interested in forming a trail committee to work on getting the trail from Harbor Springs towards Bay View to connect with the trail that ended in Bay View at Division Street. Ray Kuczwara, a Harbor Springs Kiwanian, enticed Neal McCue to join him and Ceci Bauer in their efforts to establish a Harbor Springs Trailway Committee. Fettis and Putters began meeting with them and a few others on a plan to get a 1.5-mile trail paralleling M-119 from Beach Road past the Petoskey State Park and ending at the railroad crossing at what is now Spring Lake Park. The reason for selecting this particular segment for starting the linkage between Petoskey and Harbor Springs was to take advantage of an MDOT road project to widen and straighten M-119 in this area. In discussions with MDOT and the Emmet County Road Commission, they were amenable to doing this providing the local group raised the $28,000 local match money for an ISTEA grant. This was not only raised but exceeded by about $5,000. This fund-raising was aided considerably by the Petoskey-Harbor Springs Area Community Foundation which acted as a well recognized and tax-exempt recipient for all of the donations. The Community Foundation’s Executive, Maureen Nicholson, acted as “banker”, bill payer and mailed out thank you letters on behalf of the Trailway Committee. The excess match money ultimately ended up in TOMTC’s coffers at a time when it was sorely needed. 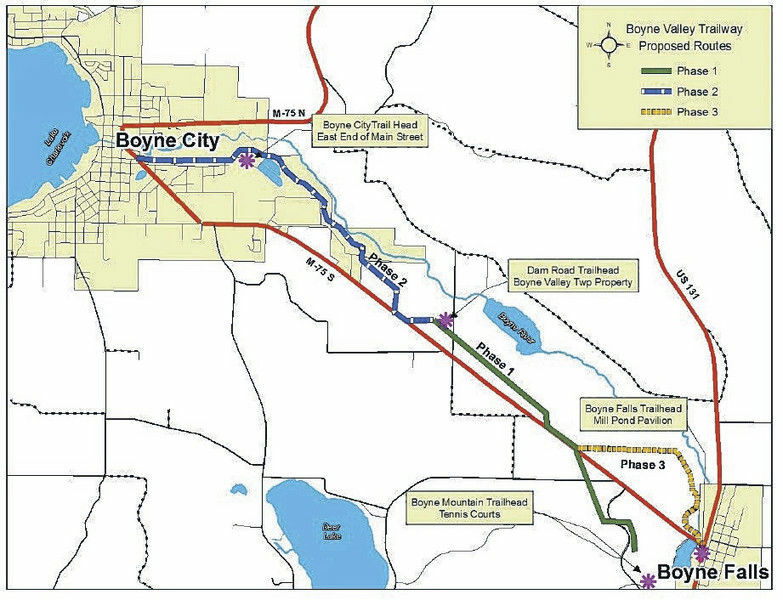 The Emmet County Road Commission acted as grant applicant and grant administrator for the trail portion of the project. All of this early trail system commentary is included to set the stage for TOMTC’s entry on the scene for establishing and coordinating a regional trail system. 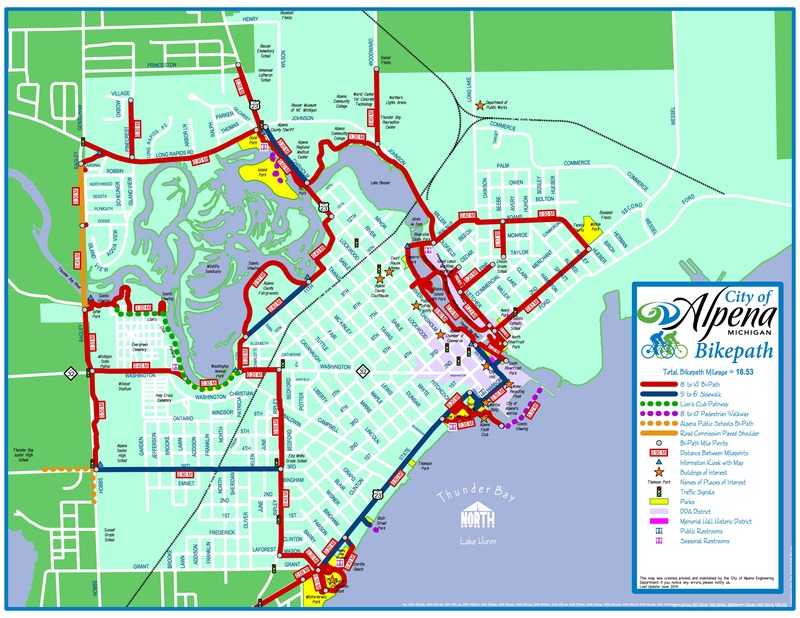 The Trails Council’s network currently is made up of over 300 miles of trails, stretching from Charlevoix to Alpena, from Lake Michigan to Lake Huron. This network is continually growing, thanks to the advocacy of the Trails Council and its partners. Our goal is to make Northern Michigan a destination for trail users from far and wide. We make trails happen!